Bollywood's favourite fashionista, Sonam Kapoor, can't stop smiling! 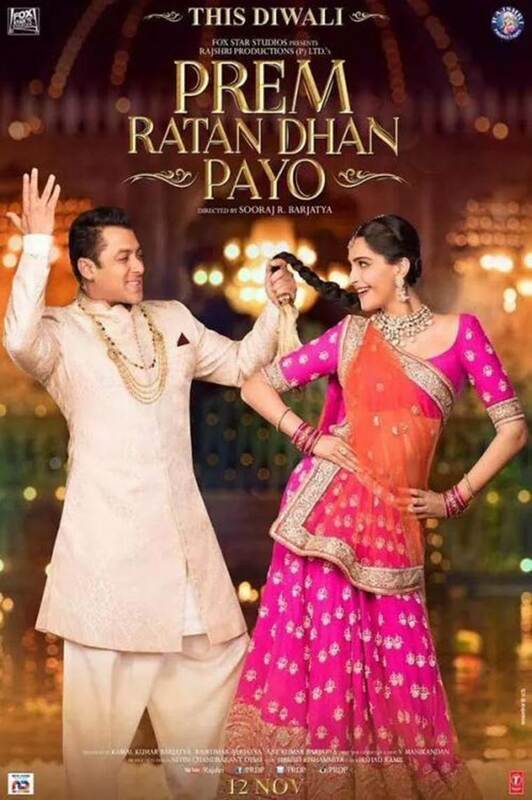 After all, she is the new Rajshri heroine on the block, and her film, Prem Ratan Dhan Payo (which hit the screens today) is already on the path of creating new box office records. We meet her on a hot and humid day, filled with promotional activities, at a suburban film studio. She successfully juggles between solo interviews, channel interactions with Salman and posing with a Diwali lantern, diya and thali filled with sweets for the shutterbugs. The actress has a flight to catch within a few hours (a store opening scheduled in Delhi the next day is on her mind). After completing all the commitments (dressed in a pretty black and gold ethnic dress), Sonam changed into something more comfortable for her journey (and her last interview for the day - with us): a crisp white shirt and Nehru jacket. The minute she is told about Athiya Shetty's compliment (that when it comes to personal style, nobody can be compared to Sonam Kapoor), she quickly stated, "Very kind of her to stay this, but I don't think that's true. There are several young girls and other people who are more talented, prettier and fashionable than me. I just think I am very lucky girl and a lot of things have happened because I am very fortunate." Well, that speaks volumes about Sonam's approach towards life and work. She is a no-nonsense person, who loves working hard on getting her character right, as much as she loves dressing her best at every event. With a bowl of salad on one side and a cuppa from Starbucks next to it, she quickly settled down for a short and sweet conversation, talking about Prem Ratan Dhan Payo, working with Salman, Feminism and more. Rajshri heroines have always been iconic. What was your experience of being Princess Maithili, and acting in a Rajshri film like? It was amazing! Honestly, I love the fact that my character knew what she wanted. In fact, I was just discussing this with Sooraj ji (Barjatya) right now. It's like, during the process of giving these interviews and talking about my character, I realised the importance of a character like Maithili. Her first talkie scene in the film is where she tells her fiancé, listen to me and tell me what is wrong. If you don't communicate, then forget this relationship. I'd rather be alone and be very happy on my own, than be in this relationship and stay unhappy. A lot of girls these days are so afraid to be alone, that they just carry on with their relationship, whether it is with a husband, boyfriend or anyone. And, they just don't say anything. They don't realise that they are strong, capable women and it's okay to be alone. But instead, they prefer being afraid. You know, there is a line in Jerry Maguire that goes, "You complete me." But I believe that you cannot be with someone until you are complete. So, that's one thing that I really like about Maithili. She is not dependent and can take decisions on her own. Which is your all time favourite Rajshri film and why? Hum Aapke Hain Kaun (smiles). The reason is quite simple, as it was the first film that I fell in love with. During a recent event, you mentioned that the only two mega stars that you have worked with so far are Hrithik and Salman. Tell us about your experience of working with the two of them. Well, with Hrithik, it was just three days of work, while with Salman, it was 220 days (laughs). Also, I was fortunate to share the screen space with Salman in my debut film, Saawariya. So, it's obvious that I know Salman way better than Hrithik, despite the fact that I have grown up with Hrithik. There's a huge different between their style and approach towards work. But, both of them are great human beings and very professional. No two actors share the same kind of working style. Is it the same with all the other actors that you have worked with? Yes! Because after all, not all the people are same. But, they might have a few similarities here and there. Like, both Fawad (Khan) and Ranbir (Kapoor) have a similar approach towards their work. Shahid and Hrithik work very similarly, because they believe in putting a lot of efforts while rehearsing and are very methodical. As far as Salman is concerned, people have certain assumptions about him, but honestly, he is one of the most hard working human beings I have ever met in my life. He wouldn't have been 'The' Salman Khan, if it wasn't for the way he is. He would work out three - four hours before the shots, knew all his lines and scenes by heart. His rehearsals were bang on. Even after the shoot, he used to work out again and eat right. He is very disciplined. For outdoor shoots, he used to be up by 5 am. There are certain things that you may not expect from such a huge star, but he is a complete workaholic. Is there a takeaway from any film or character that has stayed with you for long and changed your perception towards a particular thing? You know, before every film, I realise that the character I am supposed to play is nowhere close to me and the biggest challenge for me is - How am I gonna do this? That's when you try to build and create your character and once we finish the film, I realise that somewhere, there is a little bit of me in that part that I just finished playing. So, I do take back something from each character that I have played. Like in Saawariya, I learned patience, while in Delhi 6, I learned to live for my dreams, no matter what. Then, Aisha taught me that friends are an extremely important part of your life, while I Hate Luv Storys made me realise that what you think is right for you, may not actually be good for you. Raanjhanaa taught me that you can't judge a person for the choices that they make. A lot of people didn't like Zoya (Sonam's character in the film), but she was a Muslim girl from Benaras who fell in love with a Hindu boy, and she tried her best to sort things out in the right way. Zoya taught me to be less judgemental. Khoobsurat taught me that no matter how amazing your prince charming is, don't change for anyone, because the boy should change for you (laughs). Your on screen avatar in films is often in complete contrast to the way you are in real life - a fashionista. Do you think that is where the real challenge of getting into the skin of a character crops up? What to do? My directors like me like that only (laughs). In fact, I have been trying to figure that out myself. Like for Prem Ratan... Anamika (Khanna) worked on my outfits and we had earlier worked together on Delhi 6, Mausam and Bhaag Milkha Bhaag among others. When PRDP came up, she was like, "I can't make another sad set of outfits." I was like, "Don't say that. In Raanjhanaa, I was almost wearing the same Kurta in the whole film." But fortunately, PRDP gave me the chance to wear heavily embellished, princess inspired outfits. I have never worn such outfits on screen. In fact, I haven't worn make up in so many films. But, after three days of running around in those heavy lehengas, I was dead! (laughs) It's a good thing that I don't have a set image when it comes to the way my characters look on screen. Each one of them have looked quite different. Is that also why you prefer choosing scripts that give you a chance to get into a different space with each character? Absolutely! I don't think I have ever done a role which has been similar to something that I have done in the past. Maybe that's why, people have a tough time remembering my roles. But, they remember it when I remind them (smiles). Like a Khoobsurat that I did straight after Raanjhanaa was completely different, and so was Dolly Ki Doli. Even now, after Prem Ratan Dhan Payo, I am doing a film like Neerja, which is more on the serious side and has me playing the main protagonist. I don't wanna get bored of my job. Also, it's important to reinvent yourself, because every time you come on screen, you need to look fresh. You must give people a chance to look forward to what you are doing next. Many actors are taking to the small screen today. If given a chance, what kind of show would you like to be a part of? I would love to do television. But, not reality shows for sure. I get stressed out even during promotions. I would like to do something like 24, which was started by AKFC. The whole idea was to bring cinematic content on the small screen, which is great. So, I would love to do something like that. Ranbir (Kapoor) said that he would love to see you host a chat show. Oh! Ranbir said that? Well, that's because I can make anybody say anything (laughs). You have always been quite vocal about your stand on feminism. So, what's your personal definition of it? My definition matches the one that is written in the dictionary (smiles). It is important for us to stand up for what we think is right. It is necessary to promote female empowerment and make sure that everybody gets equal opportunities. Also, promoting tolerance is absolutely necessary. Feminism is not just applied to women, but also to men, transexuals, homosexuals; anyone can be a feminist. Its's just that, people have this preconceived notion of what Feminism means. Feminism is for anyone and everyone for stands up for female rights. She is a fashionista,... I love the way she dresses herself,..